1. First lift the car, remove the wheels and remove the brake pads. My three guides from Series 1 can be found here and step you through each of these items. Click the screen or Suggested card link at the top of the screen. 2. Now gently press the brake pedal. This will move the pistons out making them easier to remove later. Watch the pistons when you do this as you only want them about half way out. 3. Next you will have to remove the brake hose from the caliper. If you have rubber hoses you can simply clamp them then unscrew from the caliper. If you have steel braided lines then these can’t be clamped so you’ll have two options. The first is to remove the steel hose and fit a spare rubber one and clamp that. The second is to screw a similarly sized bolt into the hose to plug it. Here I’ve used a M8 bolt and a piece of plastic so seal the hose. A pack of assorted bolts can be bought from most online retailers and there’s a link to where I got mine in the Description box (http://road-and-race.co.uk.tools). Click the screen to see my step by step guide from Series 2 on how to remove brake hoses. 4. Now we need to remove the caliper from the hub. It’s kept on with two large bolts. 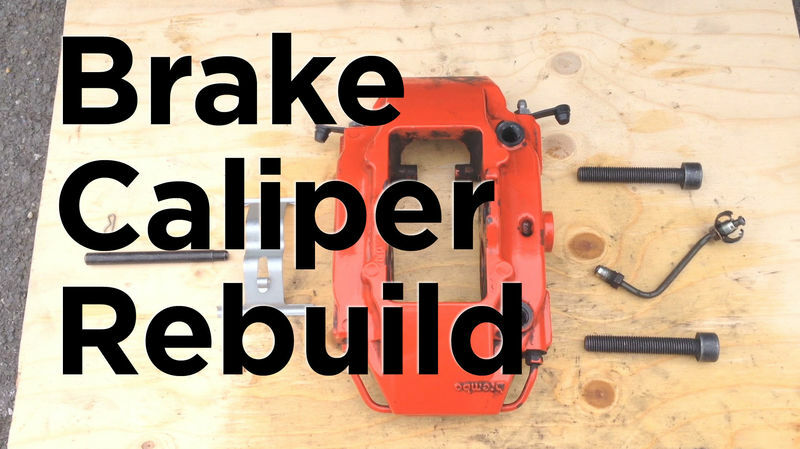 Take a breaker bar, crack them loose and remove them. 5. So here’s a look at what we’ve removed so far. 6. Next up is to remove the brake hard line. Use a flare spanner for this to avoid rounding the nut. 7. Now remove the bleed valves. 8. Remove the dust boots. You may need to use the pick to get some out. 9. Now to remove the pistons. Some may simply pull out. For the rest the safest approach is to use compressed air and blow them out. I don’t have an air compressor so I’m going to use the budget option which is a large screw driver. Take your time with the screwdriver and apply controlled pressure as you don’t want to damage the piston. 10. Here’s the caliper with all 4 pistons removed. 11. You’ll see that two are slightly larger than the other two. This is the rear brake caliper and we have 30 mil and 28 mil pistons. The fronts use larger 40 mil and 38 mil pistons. 12. Now inside each piston bore is an inner seal. This stops brake fluid leaking out. Using the pick gentle pry it out. Repeat on the other 3. 13. If the pistons or piston bores are dirty you should clean them with brake fluid. You should inspect the pistons and bores for rust and replace if damaged. 14. At this stage you have the option of preparing the calipers for re-painting. I may do a video for this in the future but mine are still in good condition so I’m just going to clean them up with some brake clean. 15. So here you can see what needs to go back on. We have two bleed valves, four square cut inner seals (apologies only two are shown here) and four dust boots. 16. Unpack the first inner seal, coat it with new brake fluid and insert into the bore. Take care that you are using the correct sized seal for the bore. 17. You should be able to see here that the seal is fitted flush in the groove. Repeat on the other 3 bores. 18. Take a piston, coat it in brake fluid then insert it three quarters of the way into the correct sized bore. They will be stiff to push in but you should be able to do it with just your hands. Worst case you can use a clamp to help but you risk inserting them badly so be careful. 19. Now attach the dust boot to the piston. Make sure it fits correctly over both the piston head and into the caliper slot. 20. Repeat on the other 3 pistons. 21. Now we’ll fit the bleed valves and dust caps. 22. Push the dust cap on the valve and screw into the caliper. Repeat with the other valve. 23. Gently tighten both valves with a flare spanner. 24. Here’s an overview of the new bits next to go back on. 25. Gently screw the brake line back onto the caliper. No need to tighten yet as we will do that when it’s on the car. 26. Apply thread lock to the caliper bolts. 27. Place the caliper back onto the wheel hub and screw both bolts in. Look in your manual and torque to the correct spec. In this case it’s 85 Nm. 28. Move the brake line to the correct position and tighten it up using a flare spanner. 29. From this point on you need to reconnect the brake hoses and fit the brake pads. My previous guides that step you through this are in Series 2 and are available by clicking the screen now or the Suggested card link at the top. 30. With all the new bits back on the brake caliper it should now look like this. 31. Once all 4 calipers are rebuilt you will need to bleed the brakes. My guide from Series 1 steps you though how to do this. Thank you! I haven't been able to find a good write up like this and also with video that I will be watching when I am no longer at work. Edit: this way, you can just disconnect the caliper from the hard line and not have to fiddle with the brake hoses at all. Be very careful if using compressed air to remove pistons. They can exit the caliper with great force. Saw the video last night, thanks for posting! Kroll is your friend on the mounting bolts and lines. what are the 2 - 1/2" round pins inside the caliper? Is your rotor loose for any reason, like you are disassembling? Maybe it is wobbling and when you get the wheel bolts on it will hold it. A totally trashed wheel bearing may allow enough run out to where it might contact the pins as well.